Artists from The Dirty Canteen reflect on the politicization of survival through a body of work that seeks to comprehend, reflect, and educate on what is “taking place” in our country, in our military, and in our world. 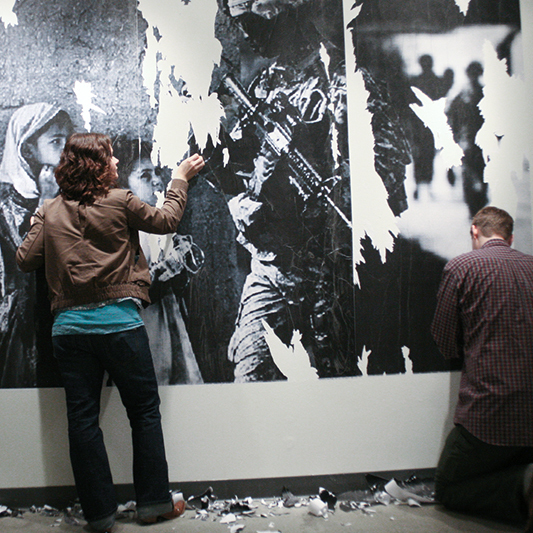 The exhibit acknowledges the complexities of truth while deflecting the complicity of war advocates. The Dirty Canteen – In the military we were issued brand new canteens, but after many training exercises and deployments the canteens became worn, abused and dirty. The Dirty Canteen is a metaphor for our involvements and experiences while in the military. We were soldiers and humanitarians and though we can no longer do so in uniform, we choose to continue this service to others by using the arts. We served in conflicts from Afghanistan, the Gulf War, and Iraq. There are nine members of the Dirty Canteen artist collective. All of which serve(d) honorably in the military and aim to raise awareness about issues veterans face while returning home from conflict. Our stories and work translate into conversations that try to bridge the gap between military and civilian cultures. This dialog hopes to bring understanding of how war and trauma not only affect members of the military, but our society as a whole. Our mission is not to promote a particular belief but to pose questions about the many difficult and genuine concerns the American community possesses about current and past military engagements. We wish to share our stories, artwork and message of peace and appreciate the opportunities to do so.